The skull houses and protects the delicate tissues of the brain, while the 24 moving bones of the spine support and protect the intricate communication pathways of the spinal cord and its exiting nerve roots.These nerves then travel throughout your entire body, connecting to and regulating the function of every cell, tissue, joint, muscle and organ. 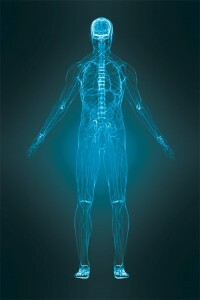 Under the proper control of your nervous system, the body is designed to function well and resist injury. A possible interference to the nervous system is the twenty four moving bones (vertebrae) of the spinal column. A loss of control of normal motion of these vertebrae (termed a subluxation), might irritate or impair the function of the nervous system. This irritation might then disrupt the transmission of the continuous nerve (electrical) impulses to and from the brain, just like the dimmer switch on a light, potentially resulting in weakened performance of the body region supplied by those nerves (refer to our interactive spine above). In many cases spinal problems develop slowly over time without any clues to their existence – a bit like tooth decay, heart disease, and arthritis can. But the ‘problem’ might not be what you think. As Chiropractors, we aim to improve your body’s function through specific Chiropractic adjustments. In the community it is widely thought that Chiropractors only adjust the spine, and this certainly is the case for some. However, Chiropractic and anatomical education teaches us your nervous system extends into and receives influences from well beyond your spine. That is why we approach your treatment from a whole body perspective. Firstly we focus on the spine, skull and pelvis, ensuring stability and control is achieved centrally. Secondly we look to address any other imbalances within the peripheral musculoskeletal body (ie. joints in the legs, arms, jaw, and their muscle compartments) that potentially hinder the spine from achieving stability due to abnormal movement patterns. By adopting this approach to your care, we might be able to unlock the layers of interference (sometimes non-symptomatic) that may have been contributing to the underlying cause of your present injury or complaint. Our goal at Impulse Chiropractic is to help you achieve better health, wellness and stability in your life, by assisting your body’s proper biomechanics and potentially improved nervous system function. Chiropractic Health care also places an emphasis on nutrition and exercise, wellness* and healthy lifestyle modifications. Wellness is a lifelong process of assuming personal responsibility that empowers the individual to exercise choice, make informed decisions and take action toward a more balanced, dynamically sustainable and fulfilling existence in all dimensions of life. Chiropractic care concentrates upon the possible causes of health problems (from physical, chemical & emotional stressors), and not merely the pain symptoms, potentially enabling your body’s health to be expressed. So essentially, you might move better, feel better and/or function better with Chiropractic care!